By Ernie from Peoria Ill. 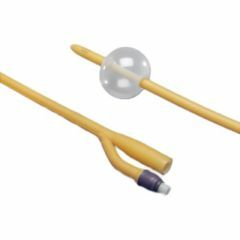 The Silicone Coated 2-Way Latex Foley Catheter uses a silicone oil coating on the shaft which allows for easy insertion, making it more comfortable for the patient. Note: The silicone coating does not protect again any latex allergies! The catheter has large, smooth drain eyes for maximizing drainage. To ensure proper inflation and deflation of the 5cc balloon the catheter has a Bedpak spring-loaded valve. 85 yrs old Retired 21 yea. 85 yrs old Retired 21 yrs. What makes this a 2-way catheter? I just use whatever the dr gives me.